Our product range includes a wide range of chelated micronutrient mixture fertilizer, multi mirctonutrient fertilizer(complete edta chelate) and water soluble trace element fertilizer mixture. CHELATED MICRONUTRUIENT MIXTURE FERTILIZER . It is atriple powered formulation of fully chelated micronutrient fertilizer for foliar Spray, with the characteristic properties of Zinc, Boron & Calcium. Benefits :- Regulates generation of plant hormones by natural metabolism. Makes Pollens& Pollen tubes healthy, Blooms up flowering & enhances fertility rate. Keeps cell wall healthy, protects fruits from cracking, shape distortion, make crispy. Enhances &strengthens growth of crops. Detoxifies the effects of heavy metal in nutrition also nullify the toxic super peroxides. Helps plants to overcome through adverse effects of weedicides & insecticides in plant metabolism. ZINCABOR is free from sodium ions, have no adverse effects in higher doses also. 2.5 to 5 ml/ litof water ( First add Zincabor in water then add other ingredients ) after 15 days of plantation or start doses 21 days after pruning of sticks in case of grapes, in case of pomegranate after 15 days of first irrigation & repeat doses after every 15 days till the end of the harvests for all crops. Compatibility :-ZINCABOR is 100 % Compatible with all kinds of fertilizers,weedicides, fungicides, insecticides& plant growth regulators. Release WMF is a balanced combination of all micronutrients required for normal growth& reproduction of crop plants. Micronutrients in Release WMF are fully chelated & are 100% water soluble. These nutrients are working in a wide range of pH of soil when applied either directly or through fertigation. Thus Release WMF helps to overcome the deficiency of Micronutrients when used judiciously. Release WMF is a greenish micro granule. Release WMF is almost fully absorbed by the roots when applied to soil & by the leaves when sprayed on the foliage. Hence suitable for any type of application. Release WMF provides all micronutrients like Zinc, Iron, Manganese, Copper, Boron & Molybdenum. Contains Magnesium & Calcium in a balanced proportion for enhanced efficiency. This helps normal growth & reproduction of the crops. 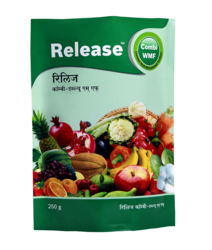 Release WMF helps in better photosynthesis, better root developments, profuse flowering, pest & disease resistance & helps in many such biochemical & physiological reactions in the plant system to increase the yield qualitatively & quantitatively. Foliar Spray :- 0.5 to 1.0 gm per Liter of water. Compatibility :- Release WMF is compatible with all kinds of fertilizers. Release WMF is compatible evenwith phosphatic fertilizers too. Advice :- for best results apply Release WMF within 2 weeks of planting and before flowering. Note:- Use a back flow check valve to prevent the material from getting into the water supply. Mingle contains all important microelements in partially chelated form. All these micronutrients play an important role in physiological & biochemical processes of the plants. Benefits:- Mingle is specially formulated as the state of the art technology for delivering micronutrients with maximum bioavailability, tolerability & safety. 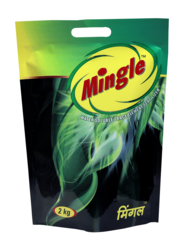 Mingle contains microelements in partially chelated form, helps easy& quick absorption by the crop. Chelating agent used is an amino acid and thus mingle is an organic complex. Mingle is a high performance 100% water soluble, available as foliar spray liquid & free flow spray dried powder. B & Mo in Mingle are not chelated. Mingle contains Magnesium as buffer to enhance its performance. Dissolve 2.0 ml to 3.0 ml Mingle in one liter of clean water & spray on the foliage early in the morning or late in the evening . Dose can be modified taking deficiency of the microelements into consideration. Mingle is also available in spray dried powder from which can be used as foliar Spray @ 250 gm / acre in sufficient quantity of water or can be given through drip irrigation @ 1 Kg to 2 Kg/ acre depending upon deficiency and crop for which it is to be used. Compatibility :-Mingle is compatible with most insecticides & fungicides. Do not use along with Phosphorous containing compounds. Looking for MICRONUTRIENT MIXTURE FERTILIZERS ?